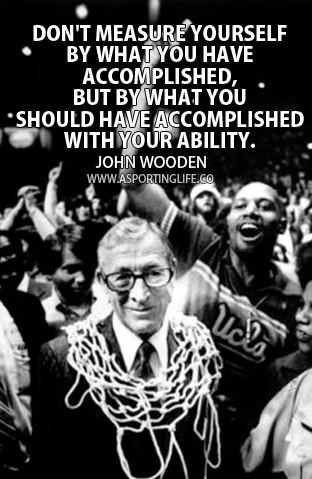 John Wooden: basketball player, coach, author and legend. Known as the “Wizard of Westwood” Wooden is probably best known as the Head Coach of UCLA’S Basketball team where he won 10 NCAA championships and was named National Coach of the Year six times. In addition to being a great coach, Mr. Wooden had a unique ability to inspire and motivate his team through his “Pyramid of Success”. Through these principles, he was able to lead one of the most successful college basketball teams to multiple titles and championships, as well as apply his system to business, professionals and students alike. John Wooden was a leader, who learned from leadership and shared his knowledge with others in order to better themselves. As a leader, do you aspire not only to better yourself but the people around you? An effective leader knows that they are only as good as the team they are responsible for. This entry was posted in Community, Leadership, Uncategorized and tagged #leader, community, John Wooden, Leadership, Management, Pyramid of Success, Vince Liuzzi, Vincent Liuzzi. Bookmark the permalink.